Background: Disturbances in the orbital prefrontal cortex and its ventral striatal target fields have been identified in neuroimaging studies of obsessive-compulsive disorder (OCD). In animal models and studies of patients with lesions to this brain circuitry, a selective disturbance in the ability to suppress responses to irrelevant stimuli has been demonstrated. Such a deficit in response suppression might underlie the apparent inhibitory deficit suggested by the symptoms of OCD. To date, little direct evidence of such a deficit has been reported. Further, although OCD commonly emerges during childhood or adolescence, few studies have examined psychotropic-naive pediatric patients near the onset of illness to find the possible role of atypical developmental processes in this disorder. 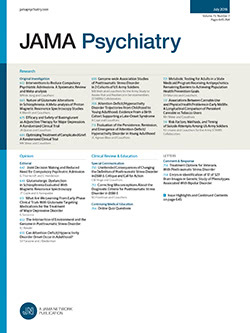 Methods: Oculomotor tests were administered to 18 psychotropic medication—naive, nondepressed patients with OCD aged 8.8 to 16.9 years and 18 case-matched healthy comparison subjects to assess the following 3 welldelineated aspects of prefrontal cortical function: the ability to suppress responses, the volitional execution of delayed responses, and the anticipation of predictable events. Results: A significantly higher percentage of response suppression failures was observed in patients with OCD (P=.003), particularly in younger patients compared with their case-matched controls. No significant differences between patients with OCD and controls were observed on other prefrontal cortical functions. Severity of OCD symptoms was related to response suppression deficits.